Nigerian music producer and singer, JJC Skillz has revealed how he met his wife and fell in love with her in 2013. 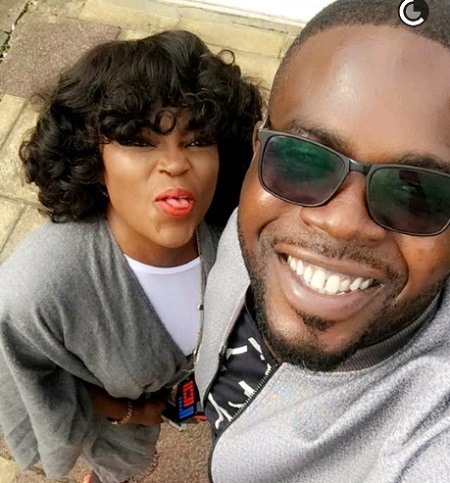 Abdul Rasheed Bello popularly known as JJC Skillz, husband of popular Nollywood actress, Funke Akindele has revealed how the couple met in 2013 and fell in love. JJC Skillz disclosed this in an interview with Nigerian Tribune. "She wanted someone to direct her TV series, then I was about to embark on recording the JJC album then. Her sister introduced us, because she knew I was into music video directing." JJC Skillz hinted and added that it was love at first sight. The movie producer said that his main aim now is to focus on his movie directing career with two major productions Jenifa’s Diary and Industreet. He disclosed that he had certificates in TV and video production, and had worked in that industry for 2 years. “I actually studied TV and Video Production in school. After my studies, I went on to take on MVQ course; which is like a work training course. I had 9 straight A’s during the course from script writing, directing, all. I did it so passionately, I came out with distinctions. Because of my grade, I was able to get a job with an amazing advertisement company. I was their assistant editor and worked there for 2 years. So, I had a background in entertainment, directing, editing, it’s what I studied and it’s now my profession. But I left all that for music,” JJC Skillz said. Speaking on the challenges he came across in his directing career, he said: "It hasn’t been easy, but God has been there for us.All I can say is he who findeth a wife, findeth a good thing and obtained favour from the Lord. Most times, as a single man you carry almost all your burdens alone. You’d have to worry about what you eat, and my cooking skillz it’s not really that fantastic. But when I found my wife, I knew I had found my better-half. Now, when I think about things, I share it all with my wife. We wake up from same bed in morning and head to our field, because we are both in entertainment. She’s the actress, script writer. I’m the director, editor. She’s very hard working. I don’t know anyone like us in this industry. She works day and night. We wake up every single day, with the mind set of making ourselves happy. So, challenges are nothing to me anymore." As busy as you have described your wife and as budding as your skills are in cooking, how does your wife still have time to cook for you? Or doesn’t she? Why not? Yes, she does. It is said that the best way to a man’s heart is through his stomach. Definitely, she cooks amazingly, but I told her to stop, so she can get enough rest. Most times, she would insist, because she wants to take care of her man. But I always insist, as we now have chefs. Was it her cooking skillz that attracted you to her? So, how does it feel being married to a popular actress? To be honest, I lived the better part of my life in the UK, so I didn’t really know who Funke Akindele was. When I met her, I just met someone that wanted a director for her TV show; Jenifa’s Diary. That was in 2013. We have been going on for a long time, people just found out in 2016. We were very low keyed, because we are two popular people in the entertainment industry. We had to protect our privacy. He also debunked rumours that he had a quarrel with his cousin Moe Musa, which led to Moe leaving his house. “Those who instigated such reports are very stupid! People just say and publish whatever they want without proper investigations and still get away with it. Mr. Moe Musa as at then moved to the next block after mine. I lived in block H, while he is in block G. I spoke with the agents that got him the apartment and he moved in. He used to be in a room in my 3 bedroom apartment, so when my relationship got serious, he moved on. That’s not even the main reason. Moe has been in Nigeria then for almost 6 months, so he felt it was time to get his own place. To be honest, when you first relocate to Nigeria, you’ll find it very hard to stay alone because you don’t understand the system yet. The way things work in Nigeria is different from the way they work in other countries. Moe stayed with me for a while, so he could get used to the Nigerian system. How to get food, how generator works and other confusing stuffs,” he said. He also talked about Olayode Juliana (Toyosi in Jenifa’s Diary) leaving the series. I don’t know why Toyosi left and it has nothing to do with me. Just like any character in a TV series, she can go and return. The only permanent character in the series is Jenifa. Falz has gone and came back, Toyosi has gone and maybe would come back. In the script, Toyosi is married and has gone to France with her husband to live for a while. So, anything can happen. When she comes back, you’d see her on screen, if not, then that’s what the script said. How did you meet Funke Akindele? She wanted someone to direct her TV series, then I was about to embark on recording the JJC album then. Her sister introduced us, because she knew I was into music video directing. So, when I met her, she told me she did a movie sometime ago and would like to turn it into a TV series. We started working together and preparing for the shoot, then one thing led to another. Here we are today, the rest is history. We just clicked. Well, I would say so, because first time I saw her, I was wowed. She also told me the same thing. We tried to keep the whole work as professional as possible but along the line, emotions ran high. How was the proposal? Bank W’s style? [Laughs] I’m a romantic person, so I gave her a dose of it. It wasn’t in an open place, because only very few people knew at then.So, that very day, she came home to meet flowers, candles everywhere; quite a romantic set up. When she saw it, she had no choice than to say ‘Yes’. You are both celebrities, how do you succeed in maintaining your private life? Private life, work life, we take it all one day at a time. We don’t worry about outsiders and what they would think, we just do what pleases us. Every single day, we say our prayers and talk about how the day would go. It’s quite a unique and complimentary relationship and I’m enjoying every bit of it. During the Hallelujah Challenge, you received a prophecy of a twin birth. Are you expectant? Yes. Soon! God’s time is the best. We are working on it. How did your kids accept their new step mum? Well, before we got married in London, we all had a good relationship here in Nigeria. The kids were always seeing this beautiful woman around daddy, and she always makes him happy. They might be away and in different continents, but they are part of our daily activities. She is also very close to them, they met her digital first. They didn’t know she is an actress then, because in the UK, they hardly watch Nigerian movies, but they love her so much. They all love each other. It’s a perfect blend. I remember my daughter telling me, ‘Dad make sure you marry her. She’s a keeper’. And I did, I followed my daughter’s advice.One of my songs, Save The Last Dance’ was written for my wife, she really saved the last dance for me.